It can be very difficult to create black and white shots that are truly compelling. Without the use of color, the photographer must find an exceptionally strong composition to make the image really stand out. The funny thing is, some images have such a strong compositional structure that color can actually stand in the way of the image, thus it works better as a black and white. 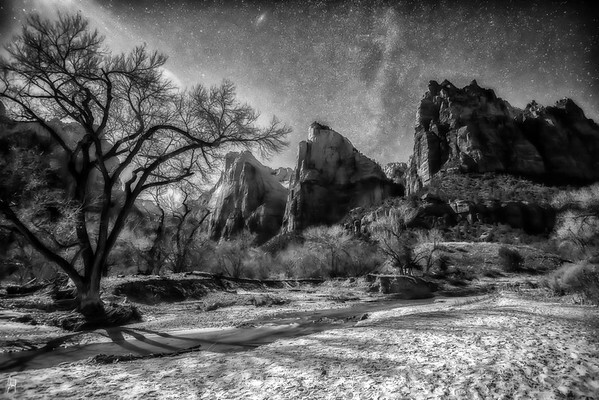 I captured this particular image in Zion Canyon at close to midnight. Since I did not have a chance to properly scout a good location before sunset, I had to work very hard to find the right shot in almost total darkness. After a great deal of time, I finally found an amazing composition that I could really get excited about. I love how that lone tree almost drapes the mountain, and the softness I added in post-processing adds an almost ethereal mood to the image.